This morning, Jesse asked me the same question I hear most weekends when we're at home "What's for breakfast, baby?". During the week, breakfasts are always the same for Jesse - either an wholemeal english muffin or wholemeal toast with two eggs and bacon. On the weekends, however, we have more time so we tend to get creative. This morning, I decided I wanted to test out a new (to Jesse) pancake recipe and the fact that Jesse was busily doing things meant that I had the perfect opportunity. You see, these pancakes have a secret ingredient - cottage cheese. Jesse absolutely hates cottage cheese - the look, the texture, the idea of eating it.. everything - so I knew if he saw me putting cottage cheese in the pancakes, he wouldn't give them a chance. So I got to work in the kitchen, sneakily cooking away and when I put the plate down in front of him, this was the conversation we had after his first bite. Jesse: "Oh wow, these are the best pancakes you've ever made... they're better than IHOP and way better than all of the pancakes we've had in Bali... what did you put in them? They can't be healthy?" Kristy: -cue happy dance- "They have cottage cheese in them - and of course they're healthy"
This was the moment Jesse became a cottage cheese convert. He told me he didn't care if I thought the pictures turned out bad, these pancakes were so good that they had to go on the blog ASAP. According to Jesse these are the Best Pancakes Ever - and I have to agree as I've been making this recipe for myself for quite some time, so it's about time I shared my little secret! 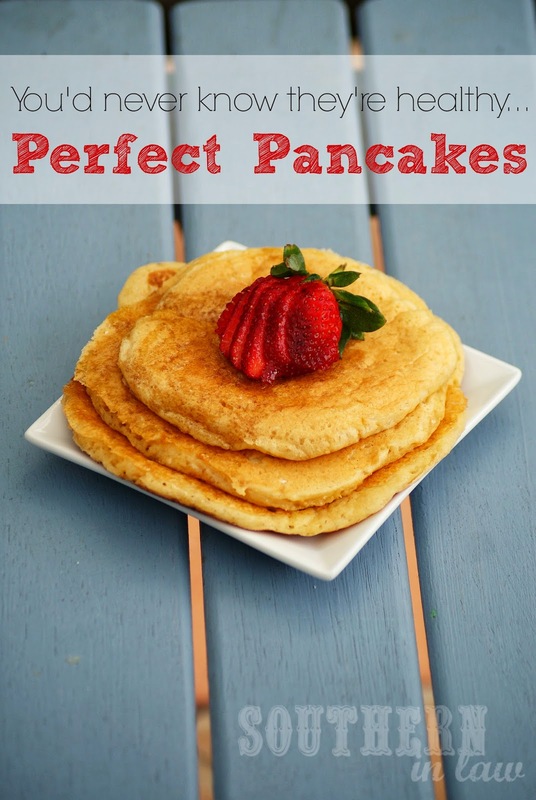 A quick and easy pancake recipe that tastes incredibly indulgent but you can enjoy a whole stack without a pinch of guilt! Heat a medium, lightly greased non-stick fry pan over a medium-low heat. Blend your egg, cottage cheese and vanilla until smooth. In a bowl, mix together your flour, baking powder and cottage cheese mixture until just combined (adding in your extra mix ins if using). 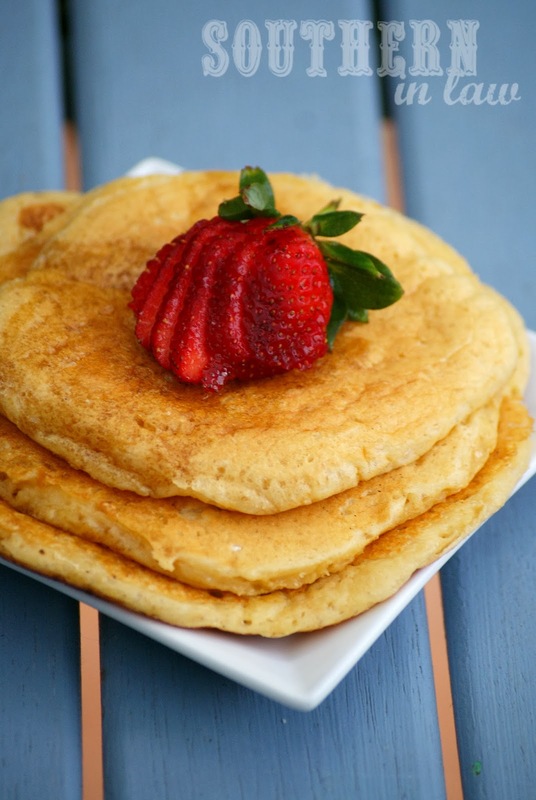 Cook your pancakes about 1/4 cup of mix at a time, using the back of the spoon to smooth and spread out the mixture. Once bubbles start to appear on the top of the pancake and the underside is set and golden, flip and cook the other side until golden and cooked through. Repeat until all of your mixture is cooked. Serve with maple syrup, fresh fruit, yogurt or whatever you feel like! **I add about 2 tsp of maple syrup to the mix for Jesse, however, I like these without any added sweetener. I'm a fruity pancake girl so I like Banana Pancakes or Blueberry Pancakes with fresh fruit, but I also love these pancakes or our Banana Protein Pancakes topped with a drizzle of PB! No syrup for me, but Jesse is a traditionalist and sticks to just maple syrup on top!